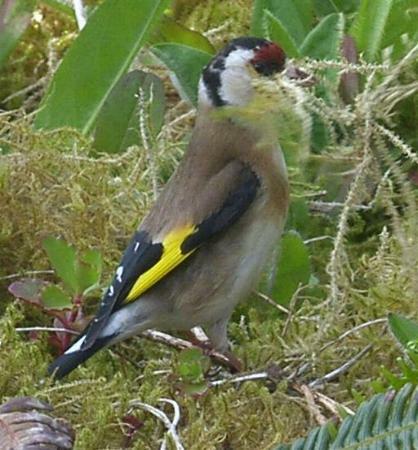 A female Goldfinch with its red face and yellow wing bars, both sexes are alike. 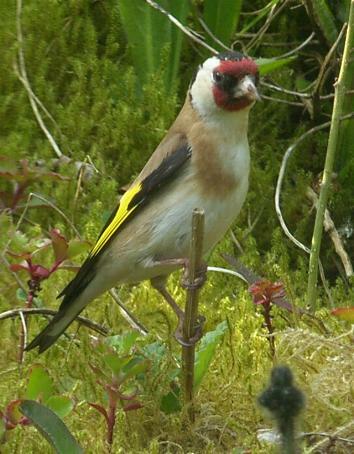 Goldfinches are to be seen in farmland areas, open ground and in gardens. Their main food sources are seeds from thistles, burdock, dandelion and knapweeeds. They can sometimes be seen fluttering above the mature heads of thistles picking out the seeds, feeding in flocks or 'charms'. Other food includes fruit of birch, alder, and some insects for feeding the young. Their twittering song made them popular as a cage bird and towards the end of the nineteenth century numbers were dwindling due to the hundreds of thousands trapped yearly. 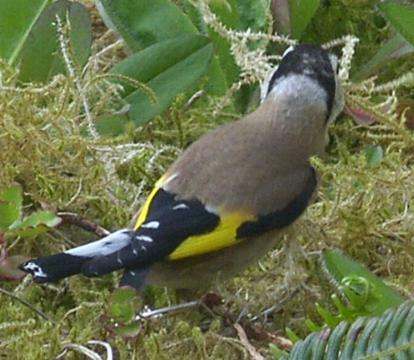 One of the first tasks of the recently formed Society for the Protection of Birds at the time was to end the trade in caged Goldfinches - it later became the Royal Society. The pictures for this monograph were taken as a female gathered moss while nest-building in late May. Other materials used are roots and grass with a lining of wool and thistledown. The male droops and partly opens its wings displaying the yellow wing-flashes as it sways from side-to-side during courtship. Both sexes have similar colouring. There are usually two broods between May and August with 5 or 6 eggs in each which are pale blue with light brown spots. The female incubates the eggs for 12 to 14 days and the hatchlings are fed by both parents. After 13 or 14 days the young are ready to leave the nest.